When I had the opportunity in May 2006 to ask Ant Phillips when exactly the long-announced remasters of The Geese & The Ghost, Wise After The Event and 1984 would finally be released, he just said “Soon, very soon.” The scheduled release date had actually passed at that time, but he seemed confident. But it was more than a year later, in July 2007, that the CDs were released – in Japan only and in the mini vinyl replica packing that is common there. The rest of the world had to wait, or buy the records at Ebay, preferably in the 8 CD box edition in a slipcase for US$ 200. The Geese & The Ghost in a bonsai LP cover is quite a sight, though the colours could have been a bit stronger. The insider cover with its explanations to Henry and the lyrics, which had been missing in the German Vertigo LP version, is present here and even cut in the same peculiar manner as the original. There is, however, no English translation of the apparently extensive liner notes that is usually included in Japanese releases. The liner notes by the boss of the project and main archivar Jonathan Dann stayed unread due to the reviewer’s non-command of Japanese language and writing. Though it was announced as a double CD there was no space in the sturdy cover for the bonus track CD. It was added in an independent second cardboard cover that has the same format as the lovingly reproduced cover of the main CD. This one, too, has only minimal information about the individual songs. The European version, released in April 2008, makes more of an effort. The booklet in the 2CD jewel case is 20 pages strong and very informative. The goose in armor (from the rear cover) hails from the labels. The attempt to take up the Gothic type from the title by using a similar font on the rear is a bit unfortunate. 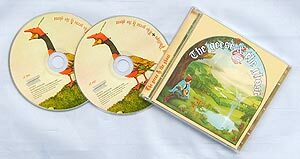 Still, there is not much fault to be taken with the design, apart from the fact that Peter Cross’s artwork is much too large for the CD format – or the other way round, the loving painted little details are way too small. You will probably only recognize the tiny knight riding a snail (bottom right) when you have seen it before in original size. It seems the publisher was quite aware of this problem: A couple of striking examples (but alas not the knight) are repeated in the booklet and the inside of the tray in an enlarged form. The album begins with a brief instrumental introduction called Wind – Tales. It is basically just a fade-in and fade-out. And it is nothing else but a one-minute cut from the orchestral finale of Sleepfall: The Geese Fly West played backwards. Which Way The Wind Blows is the first proper song of the album. 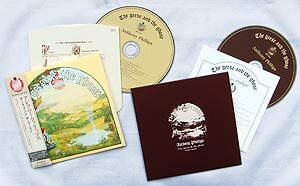 In his extensive liner notes in the booklet Jonathan Dann explains that, like all songs on the first side of the LP, the instrumental Henry: Portrait From Tudor Times and the ballad God If I Saw Her Now, it was written within the first ten days after Ant left Genesis in July 1970. (As far as God If I Saw Her Now is concerned this cannot be true because there is a demo of this song dated 1969 in Ant’s excellent sampler Archive Collection vol.1). Which Way The Wind Blows is a slow, romantic twelve-string guitar ballad with a longish instrumental part. It is sung by Phil Collins, who also sings the second voice. His vocals are as restrained as on the first Genesis albums when he was the lead singer. Phil had just completed work on Steve Hackett’s debut album, where he sang lead vocals and played the drums when he came to the Geese sessions. Though they were never members of Genesis at the same time, Phil and Ant had worked together for a couple of times: in 1973 for a demo of Take This Heart, a choral for the Charisma sampler Beyond An Empty Dream (this version is not identical with the one on Archive Collection vol.1 and hence remains unreleased), for the single Silver Song / Only Your Love the same year and finally for the demo sessions with Peter Gabriel and Martin Hall in the summer of 1974. An alternate version of Which Way The Wind Blows that was recorded in 1974 with Ant singing can be found on Archive Collection vol.1. Henry: Portraits From Tudor Times, a joint composition by Anthony Phillips and Mike Rutherford, is one of the central instrumentals on the album. It is a suite of several sections following motives from the life of Henry VII, hence the intentionally medieval harmonics and arrangement. A fanfare introduces and ends the opus. Between them there are exciting guitar duels on misty French battlefields, dying knights, victorious fights full of dramatic solos on the electric guitar and finally the triumphant return of the king with booming salute shots and the final choir in the chapel royal. The individual parts – the original has six of them, while a seventh has been added on this release – have separate titles and are illustrated with miniatures by Peter Cross as well as brief descriptions. When the album was to be released in 1977 after long disputes with the record companies, Henry’s 14 minutes playtime seemed a little too long, and so three bits were cut out, two reprises of brief phrases and the Lute’s Chorus Reprise (01:17), nearly two minutes all in all. Unfortunately the cuts were not done very well and careful listeners would notice them. Listening to the master tapes Jonathan Dann came across these pieces that were later cut out and so they decided to release the long, uncut version of Henry. It may be doubted whether the piece benefits from that. The bits that were cut out do not offer anything new, they are merely variations of existing elements. What is more, at one point a very dynamic and dramatic effect achieved by the cut is weakened. In the shortened version the staccato guitar forte with which Henry Goes To War begins follows straight from the very quiet end of Misty Battlements. Even if one was familiar with the piece the considerable jump in volume achieved by the cut is still surprising. Now that the Lutes’ Chorus Reprise has been spliced back in again at exactly this point Henry Goes To War still begins suddenly, but in a much louder passage. No wincing here, the effect is lost. In the original Virgin CD release the individual parts of the Henry suite were separate tracks; fortunately this has been abandoned. For this release index markers were used, a feature that is rarely used these days. Few CD players show them, even fewer permit you to jump to an index mark. But the index marks are not needed here because the suite is a complete unity. God If I Saw Her Now is a duet between Phil Collins and the largely unknown late Vivienne McAuliffe, whose surname is, alas, spelt wrong again the booklet. The song follows a very simple but beautiful folk picking on the electric guitar which turns into a fabulous flute solo by Steve Hackett’s brother John. Both vocalists perform unobtrusively. This lends a calm if fragile tenor to the piece that goes well with the slightly tragic lyrics. Viv McAuliffe has the complete first verse and the final lines of the second and third verses. Phil Collins sings the rest, including the final verse where his voice is doubled. God If I Saw Her Now is the thoughtful summary of the song, and that is why it ends, rather abruptly, with this line. This is also the end of side 1 of the album. Side 2 begins similarly to side 1 with a brief instrumental piece called Chinese Mushroom Cloud. It is actually just a snippet from the main theme of the title track played at half speed. Though little more than a small joke it still sets a dark, apt mood for the following The Geese & The Ghost, the second main instrumental on the album. This two-part song was composed by Rutherford and Phillips back when both of them were in Genesis. The working title was D Instrumental, and the original demo version from 1969 was published under that title on the Archive Collection vol.1 in 1996. It offers everything Genesis fans could ask for: long passages with acoustic 12-string guitars, complex rhythms, odd beats and mellotron sounds (Ant borrowed the instrument from Tony Banks especially for these recordings) as well as a string quartet that contributes to the soundtrack character of the piece. The two guitars together sound fantastic, excellent – it is impossible to tell who is playing what, the instruments play so close to each other. The instrumental certainly is an early peak in Philipp’s oeuvre and a real classic. Collections is the only piece with vocals on side 2. Ant wrote this ballad back in 1969, and he sings it himself in his introverted voice that sounds a bit unsure and brittle in the higher registers. The song begins calmly with a piano but and develops into an orchestral, almost a bit schmaltzy finale. The transition to Sleepfall: The Geese Fly West is fluent as if both pieces formed a unit. Sleepfall is basically a single eight bar melody played on the piano in the beginning, picked up by other instruments and repeated several times. The orchestral arrangement becomes bigger and bigger before it vanished in the far west together with the geese and soft flute sounds. A wonderful end for a wonderful album. Ignoring this completely the first Virgin CD pressing tacked on the Master Of Time demo as a bonus track. Though it was recorded only in 1973 it was written during the Trespass period. It was supposed to be on the album, but due to time restraints it could not be recorded during the album sessions. The songs never develops past the demo stage as far as sound quality, instrumentation and interpretation are concerned. Its length (07:38! ), Ant’s brittle voice and the simple arrangement soon bore the listener and turned the song into a kind of nuisance. Master Of Time has rightly been moved to the bonus CD where it cannot do any more damage. We may thank Anthony Phillips’ bad conscience for the second CD. He found it inappropriate to just remaster the album and sell it to his fans without any additional bonus. Thus what we find here is not only Master Of Time but whole string of interesting well-sorted bonus tracks. Title Inspiration is a brief solo presentation of both ARP Pro-soloist synthesizer sounds (“Geese” and “Ghost”) that lent their name to the album. They can also be heard in the title song at around 04:40. Then there are a series of basic track versions of the album pieces that were recorded in October 1974 on Ant’s four-track-TEACs in his own studio in Send. These were completed and transferred onto 16-track in July 1975 in Tom Newman’s floating Argonaut studio. First we hear the first part of the title piece reduced to two twelve-string guitars. The melody and the cooperation between the instruments can be heard here free from all the rest of the arrangement. Collections Link is a brief piece on the piano which was to be the transition between the first part of the song, recorded 1974 in Send, while the second, orchestral part was finished only together with Sleepfall in October 1976 at Olympic Studios. The basic track of Which Way The Wind Blows contains only the two twelve-strings with a closing section that is slightly different from the final version, but no vocals. Silver Song has the same instruments, but it is a real surprise because this is a new recording – almost a year after the (unreleased) version with Phil Collins – which was made during the basic sessions for the Geese album. There is also a early version of the Henry suite, consisting of only four separately recorded parts with a total length of 05:37. Contrary to what it says in the booklet there are no twelve-string guitars in the beginning, but a duet between an electric guitar that sounds almost like a classical guitar and a real nylon guitar. It is only the last part, Misty Battlements, that is played on two acoustic twelve-string guitars. After that there is a demo of Collections that is a bit older. It was recorded together with Autumnal, which would later appear on Private Parts & Pieces, in the spring of 1974 for Tony Stratton-Smith, the boss of Charisma Records. It may be noted that Ant’s lamenting voice is almost identical with the final version. The piece after that is the second part of the title song, recorded at the four-track sessions. Many instruments that have the melody are missing here, so that there seem to be gaps. But it is interesting to hear what both guitarist play as “background” and what’s more, how great they play together. The basic track for God If I Saw Her Now was recorded by Phillips along in late November or early December 1974 while Rutherford was away on the Lamb Lies Down On Broadway tour in North America. Ant plays what was to become John Hackett’s flute solo on his Fender Stratocaster. Sleepfall is the final in the series of basic tracks. This was recorded about two years after the other basic tracks when Ant had finally found a record company that wanted to publish the album and the album had to be finished. Here it is just him on the piano and his brother Robin playing the oboe. The real sensation of this album is the first ever release of Silver Song in the version with Phil Collins at the end of this bonus CD. Phillips and Rutherford wrote this song back in Genesis as a sort of farewell for Genesis’ second drummer John Silver. At the time the song was considered the A-side for a putative Phil Collins solo single. Charisma paid for the studio session in November 1973, but did not do anything with it. BBC Radio One played the finished tape of Silver Song after an interview they conducted with Phil in June 1974 – apparently they still thought it would be published soon. The release did not happen for reasons unknown. Generations of Genesis fans had to rely on mediocre bootlegs that at first only had the BBC recording. Later tapes from the recording session with a couple of work-in-progress versions surfaced along with Only Your Love, the Rutherford / Phillips song that would have been the B-side. In 1990 Virgin re-released Anthony Phillips’ Private Parts & Pieces on CD. The album featured an extended demo version of the Silver Song as a bonus track Phillips had recorded four years previously. In the booklet Phillips said there was no chance of the Phil Collins version ever being published. The current release fulfills a dream many fans have had for 35 years, though it is hard to understand that Only Your Love is missing here. In a recent interview with Dave Negrin Anthony Phillips explained that that song had remained rather raw and unfinished because it had been recorded in a rush. Therefore he had decided not to ask Phil Collins for permission to release this song, too, after he had permitted release of Silver Song for the first time. Phillips would not rule out, though, that Only Your Love would be released in due time somewhere else, perhaps in an Archive #3 compilation. The Geese & The Ghost was released only in March 1977, two and a half years after the first recording sessions in Send Barns. Anthony Phillips describes in this epilogue how difficult it was to interest a record company in this album. Not even Charisma wanted to release the album. Tony Smith, hoewever, liked the album, and when the deal with the American company Passport Records was struck he founded the label Hit & Run Records to publish it in the UK. The album had the catalogue number HIT001; the label logo that was specifically designed can be seen on page 2 of the booklet; it featured two figures from the artwork of A Trick Of The Tail. The Geese & The Ghost was the only release on the Hit & Run label. 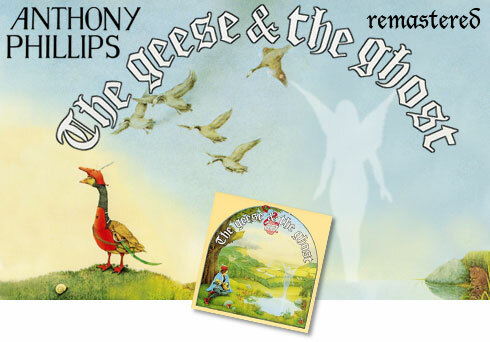 Like most ensuing records by Anthony Phillips The Geese & The Ghost did not become a hit. Not even various stickers that pointed out the collaboration of his Genesis colleagues could change that, and many faithful Genesis fans ignored the album – quite a surprise what with all the Genesis references. Most of the song were written while Anthony Phillips was still in Genesis or shortly thereafter, so their concepts and music pick up where Trespass left off. Had it been released two years earlier it would perhaps have gotten the attention it merits. But in 1977 punk and new wave had changed the music scene that the album sounded remarkable old-fashioned. The sound of the LP pressings war usually very mediocre: The dynamics in the music were far too big to fit this much music (almost 48 minutes) adequately onto one vinyl record. When there is more than 18 minutes per side the overall volume has to be reduced because the grooves have to be cut closer, and volume and groove deflection are proportional. This proved fatal for the extremely quiet passages particularly in Henry – they drowned almost completely in the basic groove noise. In 1990, Virgin Records bought the rights for all Anthony Phillips records and released them on CD for the first time (the Geese album, however, had been released on CD by Passport two years previously). They used an unknown generation master tape from Trident Studios which was definitely not the original master. The basic noise was quite annoying and disappointed everybody who had hoped for an improvement in dynamics on the CD. Jonathan Dann could now access the original master for the first time. His remaster sounds much more brilliant and lively than all previous recordings. A comparison of frequency curves reveals that higher frequency from 2kHz upwards drop. The difference is 3dB at 4 kHz and grows to 6dB in the 10kHz range – which just about halves the volume. The bass is stronger, too, on the remaster. There is a definite raise near 40 Hz, the Virgin CD’s low at 65 Hz was levelled as well as a small peak at 650 Hz. A back to back comparison makes the Virgin CD sound muffled and unprecise, while the remaster sounds fresh and strong with considerably less background noise. Getting to work at this one after all these years has definitely been worth the while.